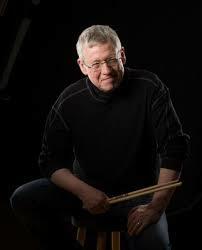 I'm very pleased this post to publish an interview with the great Drummer/Educator Jack Mouse. Jack taught at a camp I attended in my teen years, and was ( and continues to be ) a profound influence on my playing. Currently Assistant Professor of Music and Coordinator of Jazz Studies at North Central College, Jack has also served on the faculties of the American Conservatory of Music, Benedictine University, Saskatchewan School of the Arts, Clark Terry Great Plains Jazz Camp, National Stage Band Camps, Jamey Aebersold Combo-Improvisation Camps, Birch Creek Music Performance Center, International Peace Gardens, Melville Jazz Retreat. As a member of the Bunky Green Quartet, he was among the first musicians to introduce jazz education to the Montreux Jazz Festival, in Montreux, Switzerland. He has been a faculty artist member of the Janice Borla Vocal Jazz Camp since its founding in 1989. In 2012 Jack was the recipient of an Aquarian Award of Achievement, presented by Aquarian Drum Heads in acknowledgement of his contributions as a performer and jazz educator. In 2014 he was inducted into the Emporia High School Hall of Fame. A longstanding member of the Janice Borla Group, Jack can be heard on Whatever We Imagine (P-Vine Records, Japan), Lunar Octave (DMP), Agents of Change and From Every Angle (Blujazz), named among DownBeat ‘s “Best CDs of 2007,” and Promises to Burn (Tall Grass), among DownBeat ‘s “Best CDs of 2014.” Also a member of the Dan Haerle Trio, he is heard on Truth of the Matter (Seagull Records), Standard Procedure (Blujazz), one of DownBeat’s “Best CDs of 2005,” and Aspiration (Seagull Records). Jack’s multi-faceted career has been the subject of recent interviews in Modern Drummer and Jazz Improv magazines. He has authored articles for Percussive Notes and the IAJE-Illinois Newsletter. In 2005 he was a featured artist during the first online Virtual Percussion Festival presented at the University of Manitoba by the ALIVE Project (Accessible Live Internet Video Education). He has since performed with such outstanding jazz artists as Stan Kenton, Clark Terry, Herb Ellis, Joe Williams, Carl Fontana, James Moody, Randy Brecker, Billy Taylor, Tim Ries, Stefan Karlsson, Steve Erquiaga, Frank Wess, Kai Winding, Kenny Burrell, Jon Faddis, Bob Mintzer, Bill Evans (saxophone),​ Murray McEachern, Sammy Nestico, Marc Johnson, Chuck Israels, James Williams, Gary Bartz, Bobby Watson, Bill Stapleton, Matt Harris, Steve Rodby, Dianne Reeves, Sheila Jordan, Janice Borla, Jay Clayton, Karrin Allyson, Judy Niemack, Roseanna Vitro, Kitty Margolis, Madeline Eastman, Judi Silvano, Suzanne Pittson, Cathy Segal-Garcia, Rosana Eckert, Peter Eldridge, Kate McGarry, the Four Freshmen, Jay McShann, Claude "Fiddler" Williams, Joshua Breakstone, Fareed Haque, Bobby Broom, Rufus Reid, Lou Marini, Mike Wofford, Holly Hoffman, Jack Reilly Trio, Bunky Green Quartet, Dan Haerle Trio, Buddy Childers, Claire Daly, Pete Malinverni, Phil Wilson, Matteson/Phillips Tuba Jazz Consort, Chicago Jazz Quintet, Johnny Smith, Roger Pemberton Big Band, Bobby Shew, Norris Turney, John LaPorta, Jerry Hahn, Chris Woods, Buster Cooper, Ashley Alexander, Frank Mantooth, Michael Mossman, Floyd Standifer, John McLean and Scott Robinson. Jazz drummer Jack Mouse began playing at the early age of four, and by his late teens was already performing with such musical greats as Tex Beneke, Ralph Flanagan, Buddy Morrow, "Peanuts" Hucko and Red Norvo. Upon graduating from college, he spent three years as featured soloist with the “Falconaires,“ the official jazz ensemble of the U.S. Air Force Academy. Jack has presented clinics and workshops at jazz festivals, music conventions, colleges and high schools throughout the world, and presents clinics online through the ALIVE Project. He is a staff artist/clinician for Yamaha Drums, Sabian Cymbals, Aquarian Drum Heads and Vic Firth Drum Sticks. 2014 brought the debut of the Tall Grass Records label established by Jack and his wife, jazz vocalist Janice Borla. 1. Can you name a live performance and/or recording that has had a particularly profound effect on you? There have been so many, but the recordings that inspired me early and still even today are the SHELLY MANNE & HIS MEN AT THE BLACK HAWK collection from 1959 (should be required listening for anyone interested in finding out what "swing" is all about !)..... Chick Corea's NOW HE SINGS, NOW HE SOBS (in my opinion, Roy Haynes totally redefined contemporary jazz drumming on this album)..... MILES DAVIS LIVE AT THE PLUGGED NICKEL collection (all you have to do is listen to it !). I also continue to be inspired by the work of many other drummers: As I've mentioned, Shelly Manne, Roy Haynes and Tony Williams, but also Peter Erskine, Bill Stewart, Joey Baron, Ed Blackwell and Paul Motian, to name just a few. 2. You have spent a large part of your playing career working in the Chicago area, a city with a very rich and varied musical history. Do you feel that there are still stylistic differences between players in different parts of the US? If so, can you describe them? I believe that the regional differences that used to be prevalent are rapidly disappearing. In the past, you could often tell if a musician came out of New Orleans, New York, Kansas City, Chicago, or the West Coast. Today, what with everyone being so closely connected via the internet and social media, the geographical traits are becoming rather hazy. I'm not so sure whether that's a good thing or not. 3. As well as performing, you also have a busy teaching schedule. Do you notice anything lacking in some younger players that you feel they should address? The level of craft has increased considerably. Younger players are certainly playing the instrument better than ever before. The bad news is that, all too often, their skills are emulative rather than creative. Young musicians spend far too much time striving to sound and play like their heroes. Imitation has always been an essential part of the learning process as a means to an end, but should never be the goal in a creative improvisational art form. Jazz musicians should be voices, not just echoes. Virtually all truly creative, innovative people I have ever encountered have one trait in common.... CURIOSITY. Not just about music, but in all other art forms and indeed, all facets of life. This requires great patience, concentration, egoless passion and the ability to not be totally self-serving. Again, these are attributes that are being eradicated by the gross misuse of technology. For the past 22 years I have held a half-time position as program coordinator of the jazz studies program and drum set instructor for the esteemed Jazz Studies Program at North Central College in the Chicago suburb of Naperville. I attempt to impart certain values and principles to all of my students.....Every night when you lay your head down on your pillow, you need to be able to say to yourself, “I'm a better musician today than I was yesterday".....When you practice, you should practice as though everyone is watching, so that when you perform, you can play as though no one is watching....... Being a professional musician is a love/hate relationship: you must unconditionally love the music and absolutely hate playing it badly. 4. Speaking of your teaching, when I studied with you, George Lawrence Stone’s Stick Control figured very prominently in your teaching method. After all this time and the number of books and videos that have come along since then, is this still the case? Yes, the Stone method has always been a part of my teaching, as well as Ted Reed's Syncopation method and Marv Dahlgren's Four Way Coordination. Also, Roy Burns has recently released a method through Kendor entitled Relaxed Hand Playing which I am finding very useful. 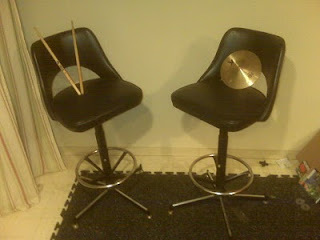 But a mainstay of my teaching is what I call “melodic transcription.” Drum set solo transcriptions are all well and good; but I believe that transcribing melodic solos (horn solos etc..) and applying them to the drum set is, perhaps, a better use of time and energy, not only as soloists, but as effective accompanists. As drummers we often rely on the rhythmic language of the drums. I believe that the highest form of improvisation is conversational. Consequently, if we are to participate in musical conversation with other musicians, we should learn and use the rhythmic vernacular with which they are comfortable. For a far more detailed explanation of this process, please feel free to visit my website at www.jackmouse.com and read the article that I authored for the Percussive Arts journal a few years ago. Another mainstay of my instruction is what I call "Rhythmic Counterpoint." For the past 30+ years, I have been writing a method book dealing with the process, and after years of rewritings, I am finally ready to release the book this year through our publishing company TALL GRASS PUBLICATIONS. The method is designed to provide a higher level of four-appendage technique and, more importantly, to open portals to more creative playing and ultimately the development of a personal style. 5. Can you explain the inspiration for Flashpoint Creative Arts, the non-profit organization that you founded with Janice Borla? Flashpoint Creative Arts is, what we feel, a logical next artistic step. For 26 years we created and produced the internationally renowned JANICE BORLA VOCAL JAZZ CAMP......the first event of its kind to focus on solo jazz vocal performance. So, folks aren't necessarily surprised to hear that we are embarking on this monumental endeavor. Essentially, Flashpoint’s mission is to promote improvisation as a means of artistic expression beyond it use in the jazz genre. Flashpoint's current - and most challenging - project is to launch a weeklong event, projected for the summer of 2019. A multi-disciplinary free improvisational arts festival (yet to be formally titled) which will bring together artists (musicians, dancers, poets graphic artists, etc...) from all over the globe to present collaborative, freely improvised performances and, of course, educational experiences. We'll keep you posted. 6. What are your future plans for Tall Grass Records, the label you co-founded? As well, what are your plans for yourself as an individual musician? For many years we had been released albums on established record labels. Eventually you become weary of being told what to record and, to put it rather un-delicately, of being taken advantage of financially. So, we consulted with many folks we trust in the business, and the unanimous consensus was that we had been around long enough with enough of a professional track record that we really didn't need an established record label to widely release our music. So in 2014 we released the Janice Borla Group's PROMISES TO BURN on our Tall Grass Records label, followed by the Jack Mouse/Scott Robinson Duo's SNAKEHEADS & LADYBUGS in 2015 and THREE STORY SANDBOX (myself, Scott and Janice) in 2016. The last two are recordings of entirely free improvisations. Flashpoint Creative Arts will also function as an umbrella organization for Tall Grass Records, Tall Grass Publishing and Tall Grass Productions, which will act as management/booking service for the Janice Borla Group, the Jack Mouse Group, the Dan Haerle Trio, the Jack Mouse/Scott Robinson Duo and Three Story Sandbox. As our lease agreements with previous record labels expire, we plan to re-release those recordings on Tall Grass Records. As for my personal plans: This summer we will be recording the next Jack Mouse Group recording of entirely original compositions as a follow-up to our 2013 release RANGE OF MOTION (Origin Records--Origin #82633)… As usual, I practice every day to get better, but I have to say that no one gets any more tired of hearing me play than I do. So, I also practice everyday to get DIFFERENT. Finally, I hope to continue to maintain an active touring schedule as a performer and clinician and a positive and productive relationship with my industry sponsors: Yamaha Drums, Sabian Cymbals, Aquarian Drum Heads and Vic Firth Drum Sticks.